See how it works *Just kidding about the breakfast. Price Spectre automatically monitors your competitors' listings and prices your items based on rules you set. 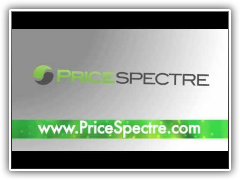 Price Spectre helps you to stay a step ahead of the competition. To set up a listing simply set a pricing rule and a floor price. Then create a specialized search for Price Spectre to perform. You can also set default search parameters and apply them to all listings at once. If your item is in eBay's product catalog and is listed by UPC or ISBN (DVDs, video games, books, etc) Price Spectre will automatically create your search for you making setup a breeze. Once a listing is enabled, Price Spectre will search eBay several times throughout the day and adjust its price based on the rule and floor price that was set. Pricing for this service is based on the number of active managed listings. A managed listing is simply one set up for Price Spectre and which is currently enabled for dynamic pricing. The first managed listing is free to help you evaluate the system. Sellers are also welcome to use Price Spectre as a bulk editing tool for manually adjusting their prices free of charge.